Vinnie Lacey, executive director of the Chicago Fringe Festival is proud to announce the 2013 design contest winner is Alex Kostiw of Chicago. 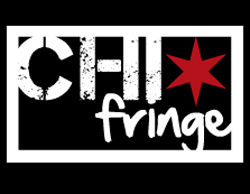 The design will appear on all marketing and promotional materials for the 2013 Chicago Fringe Festival, August 29 – September 8. The fourth annual Chicago Fringe Festival takes place at various locations throughout Jefferson Park, a new neighborhood location in Fringe’s history. The Fringe also recently held their lottery for theatre companies and individuals to be included in the 2013 Festival, a complete schedule of performances and locations will be announced in July. For more information about the 2013 Chicago Fringe Festival go to chicagofringe.org. The 2013 Chicago Fringe Festival Design Contest, now in its third year, was open to the public and launched in December 2012. The Design Committee is Executive Director Vinnie Lacey, Festival Designer Jen Dorman and former Executive Director Mikayla Brown. The Chicago Fringe Festival, now in its fourth year, presents performances over the course of 11 days annually the first week of September. The Chicago Fringe Festival is a member of the Fringe Festival movement and is one of many festivals held throughout the world. The Chicago Fringe Festival unites daring theatergoers with emerging and boundary-pushing local, national and international performing artists while seeking to engage nontraditional audiences through a commitment to low ticket prices and outreach into artistically underserved communities. Fringe participants retain 100% of their ticket sales. In its three-year history, the Fringe Festival has given more than $90,000 back to artists via ticket sales.